Mecha-Bowser Appears! is the first episode of Pinna Park in Super Mario Sunshine. The episode's objective is to defeat Mecha-Bowser. The boss fight with Mecha-Bowser takes place in the park. As soon as the player enters the park, Shadow Mario will begin running to the pool in the back. Catching up with Shadow Mario will trigger a cutscene where Mecha-Bowser comes out of the pool. 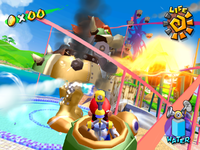 In order to fight it, the park operator allows Mario to use the roller coaster that goes around Pinna Park. As Mario rides the roller coaster around the park, he'll pick up Water Rockets the player can use to fire at and damage Mecha-Bowser. F.L.U.D.D. can only use fire one rocket at a time. Mecha-Bowser will also fire Bullet Bills at Mario, who can defeat them simply by spraying them or firing a rocket at them. Bullet Bills can come at Mario from either behind or in front. 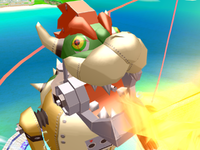 When the player gets close to Mecha-Bowser, they have to spray the Fire Breath it's shooting to avoid taking damage. Once Mecha-Bowser takes four hits from the Water Rockets, it'll be destroyed and another cutscene will play out. Shadow Mario will reveal himself to be Bowser Jr. in disguise and he and Princess Peach will fly off to Corona Mountain. Afterward, the Shine Sprite will appear in the pool. Spanish (NOE) ¡La aparición de Mech Bowser! Mecha-Bowser Appears! Italian Attenzione a Bowsermatic! Watch out for Mecha-Bowser! This page was last edited on August 3, 2018, at 20:31.